The Michigan Supreme Court apparently put an end to the City of Troy’s fight against having to pay for the land under its new Troy Transit Center. The ruling, issued Monday but not made public until today, means the city’s multiyear legal battle with a shopping center developer has probably ended, Troy City Attorney Lori Grigg Bluhm said. “We could ask (the high court) for reconsideration — I’m not sure we’ll do that,” Grigg Bluhm said. Instead, the city is poised to buy the land. On Monday, the Troy City Council voted to submit a purchase offer of $550,000 for the land, its appraised value, Grigg Bluhm said. Troy officials have said for a dozen years that the city owned the land. But in May, a unanimous state Court of Appeals decision ruled that Troy failed to abide by the provisions of a court-ordered consent agreement, which let Grand/Sakwa Properties start building the $100-million shopping and condo complex that surrounds the center while giving Troy 10 years to fund its project. The court ruled that Troy missed the deadline. The final price of the plot of land could be driven higher than $550,000 in negotiations with the development firm, or if a judge picks a higher value in an eminent-domain court case the city might file, according to parties on both sides. If so, Troy is ready with $1.8-million cash in the form of federal grant money left from the construction of the project, and approved for the purpose by Monday’s council votes, according to city documents. This week’s developments are the latest in 12 years of efforts to plan, fund and build the transit hub, praised by Gov. Rick Snyder but the focus of a recall in 2012 against former Troy Mayor Janice Daniels, who vowed to block the project because she said it was a waste of federal tax dollars. No city funds have been directly spent on the project, although city staff have expended numerous hours on it. The center’s star-crossed history has made it a prime example of the contentious path that mass transit often takes in southeast Michigan. City officials said they hope that Amtrak will be willing to sign a lease agreement with Troy, now that the city has the wherewithal to buy the land. Amtrak officials could not be reached for comment today. 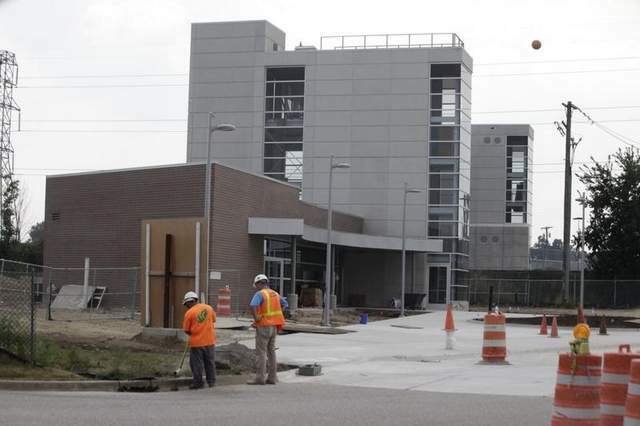 The center’s construction is done and “it’s ready to go,” Troy Mayor Dane Slater said Monday, after the council voted. In the consent agreement, a plot of land behind the center’s stores and adjacent to Amtrak tracks was transferred by Grand/Sakwa Properties to Troy in 2001 for a token $1 for construction of a transit hub, according to the opinion. But the deal contained a key condition: Troy had exactly one decade to fund the center or lose the land. “They had to do it by June 2010 (and) they didn’t,” Grand/Sakwa Properties attorney Alan Greene said in an August interview. Greene could not be reached today. Greene said then that Grand/Sakwa Properties sought not only compensation for the land but also money to cover the shopping center’s anticipated costs of wear by transit riders on the access drives through the center’s property, use of its parking spaces by travelers and the added need for security, all linked to the future Amtrak station that borders Birmingham. Shopping center magnate Gary Sakwa is unlikely to give the city a bargain after it forced a court fight in 1999 when he asked to build the Midtown Square shopping center. City officials have declined to comment on whether Troy is responsible for costs above the purchase price of the land. City Councilman Dave Henderson joined other councilmembers Monday night in emphasizing that no local tax dollars would be spent, only federal grant money administered by the Michigan Department of Transportation, to buy the land.